This post is similar to those recently created for Lower Merion Township and Radnor Township. The charts below plot data from the spreadsheet above. The X axis is always a set of price ranges. 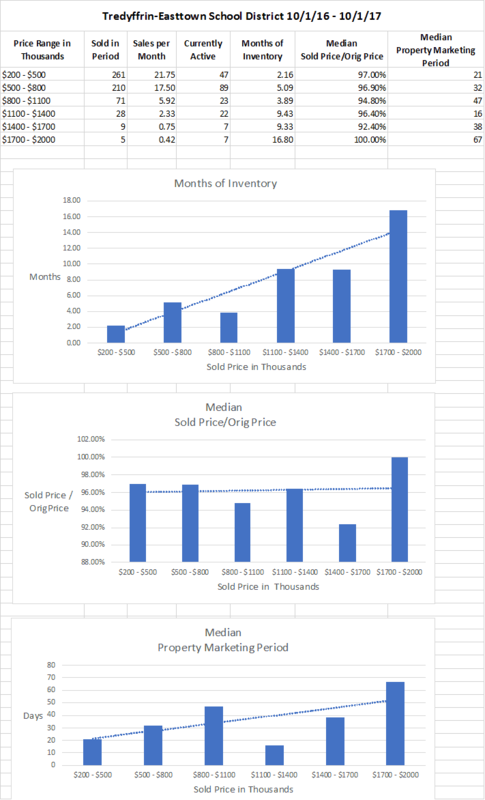 The Y axis is either months of inventory, days on the market or the sold price to original list price ratio. The data is for Tredyffrin-Easttown School District for the referenced 1 year period. The Months of Inventory chart clearly shows that the supply rises significantly above $1400k. The Median Property Marketing Period graph shows a clear trend to a longer marketing period as the price range rises. The Sold Price / Original Price chart does not show the trend of decreasing value for the ratio of sold price to original price as property price increases. The ratio is flat as price increases. In this respect, the T-E School District statistics vary from those from Lower Merion and Radnor. In residential real estate, the terms buyer's market and seller's market are characterized by the amount or months of inventory on hand. Less than 6 months supply is considered a seller's market and more than 6 months is considered a buyer's market. Per these definitions, the range from $200k - $1400k is a seller's market, and the range from $1400k - $2000k is clearly a buyer's market. In short, inventory of homes in Tredyffrin-Easttown School District is low under $1400k and abundant above it. The data from the third chart supports this conclusion. The second chart data does not support or contradict it. If you are a buyer in the $200k - $1400k range, you will generally have less ability to bargain for a lower price. Above $1400k, your bargaining power is stronger. Follow the link below for more T-E real estate stats.